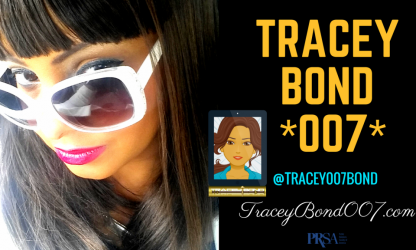 About Tracey Bond, Double O’Seven! Daily Tracey can be found sweet-spotting the spotlight online to offline for her clients by introducing, sourcing, sporting and courting their personage & perceptions with her niche for digital brand journalistic selections. As a VIP journalist, Bond’s Top 10 U.S. Press Agency’s VIP news & social intelligence news beat is globally distributed to thousands of intentional readers and trends-to-spotlight the sensible events and interests of VIP, Celebrities, Lifestyle & Society, Social Business Event News, Celebrities, Entertainment and Online Media-centric to social good. With open-cover duty this Bond girl Bond equips the ‘Face Booking U’ student of her new “Face PR” (TM) industry launch textbook to take the best aesthetic action necessary to present, defend and protect their faces as the ‘VIP’ social transactional & public relational tools that they socially are and ‘book’ their own social-to-business productivity with confident success. In a companion blog to the book http://facebookingu.com & http://facepr.org, Bond actively tracks, engages & comments on news stories regarding Face Booking U. As a former Illinois College Family Literacy Instructor, Tracey Bond is available as a speaking companion to expound upon the Face Booking U textbook content. The Gold Rush Is On For God’s Estate – Kingdom Of GOD GOLD Digger, Tracey Bond, Author >>> “Kingdom of God Gold Digger engages the reader on an expedition and exposition of truth to “unearth” a supernatural gold mine of revelation about everyone’s inheritance. Tracey’s book jumpstarts a revolutionary gold rush for the Kingdom Of God Estate. “Tracey Bond GOLD Autographs New “Face Booking U” Textbook June 21st NATURAL HAIR NIGHT OUT Jak’s!” Bond gives an A-List value to the face today, being the impressionable VIP ‘very important personal, professional & public, social transactional ‘i.d’ bio-badge of one’s social networking profile in a social media business networking society.